Equalizing ring reinforced expansion joints are a good solution for solving the challenges posed by applications exposed to high pressures. This recent project was designed, manufactured and tested for a Russian fertilizer producer. These ring reinforced expansion joints were part of a larger project which also included pressure balanced expansion joints. An optimal combination of both pressure integrity and service life is achieved when a multi-layered expansion joint bellows is supported with ring reinforcement. A 100% pressure test is always performed to verify the ring’s pressurised integrity. The rings are usually fabricated from round bar or sheet/plate in stainless or suitable alloy steels. These are then precisely machined to suit the convolutions proﬁle. In order to ensure the dimensional integrity with each convolution, the rings are always controlled via a full visual check. Equalising rings are solid stainless steel rings which are externally fitted on the bellows. The rings are precisely machined in order to fit into the root between each of the bellows convolutions. The purpose of the rings is to reinforce the bellows against internal pressure. By adding moment of inertia to the bellows cross section, the bellows tendency to blow out or buckle (also called squirm) is counteracted and its stability and pressure integrity is enhanced. Bellows with reinforcing rings can be produced for any type of expansion joint (axial, lateral or angular etc.). 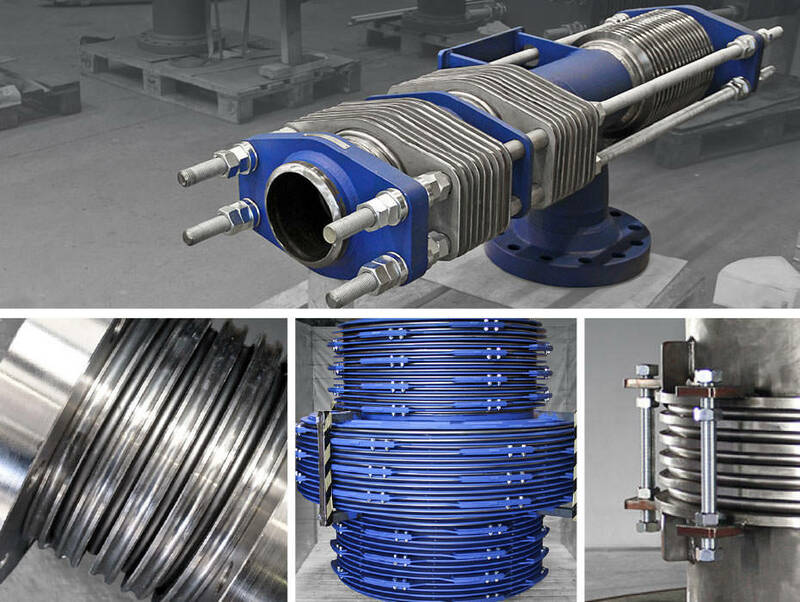 Belman is highly experienced in the design, manufacture and test of expansion joints with equalizing ring reinforcement. We have successfully manufactured expansion joints with different dimensions and for different applications, designed for a working pressure of more than 185 barg. One vessel expansion joint was pressure tested at 251 barG. Belman can deliver expansion joints with ring reinforcement in accordance with EN 13445, EN 14917 and EJMA and other standards upon request.